For those who want to stay informed on current events, weather, and traffic conditions within a community, a digital police scanner is an essential piece of equipment. Police scanners actually come in both analogue and digital varieties, but these days digital models have largely overtaken the market. With a digital police scanner, you can experience crystal clear reception, and you will be able to monitor a broader spectrum of channels. This ensures that you will never miss out on an important update. It also means you are less likely to miss out on the chance to help out in a crisis. 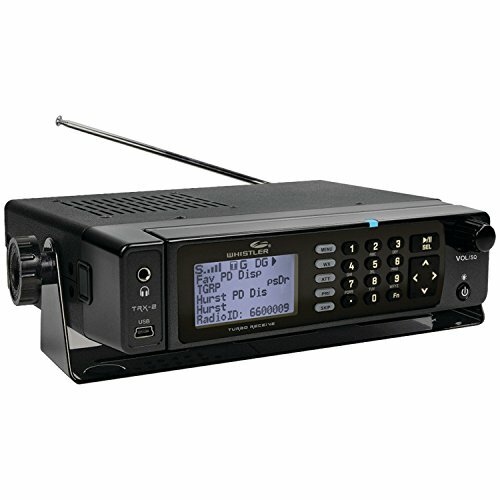 Interested in buying a digital police scanner, but not sure what models to consider? In the table below, you can compare some of the top digital police scanners. Still not ready to shop? Read on to learn everything you need to know about digital police scanners. What is a Digital Police Scanner? A police scanner, also known as a “radio scanner,” is a device which allows you to listen in on conversations between police, firefighters, and other emergency responders and agencies near your location. With it, you can monitor trunk systems or single channels so long as they are transmitting in unencrypted P25. As mentioned previously, there are both digital and analogue police scanners. Most cities are now switching over from analogue to digital, largely to digital phase 2 (more on that later). This allows for better coverage and reliability along with superior voice quality. Analogue transmissions also cannot be scrambled, whereas digital transmissions can be encrypted. Through digital systems, everyone is also assigned an ID, so it is possible for agencies to identify and remotely disable unauthorized radios. 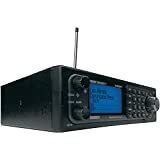 With a digital police scanner, you can listen to digital, analogue and trunked transmissions. There are two basic types of digital police scanners: handheld and base/mobile. Base/mobile: This is a fixed unit which is meant to be mounted in a single location, for example at home or in a vehicle. Handheld: This type of digital police scanner is more like a walkie-talkie. You can carry it around with you. Think about how and where you plan to use your police scanner to choose the right type for your needs. It is very unlikely for you to run afoul of the law by owning and operating a police scanner. Doing so is completely legal since US airwaves are considered to be the property of the public. You may not listen in on cell phone communications. You are not permitted to eavesdrop on encrypted communications. You cannot listen in on information which might further a crime or lead to financial profit. In certain states, you are forbidden from listening to your police scanner while you are driving. Also note that while you may sometimes be able to help out during a crisis, you should never interfere with emergency workers or block access to a site. Be aware that the above information is just basic guidelines. It does not constitute legal advice. For that, you must speak to a licensed attorney. What is phase 1 vs. phase 2? As you now know, there are both digital and analogue police scanners. Digital police scanners were developed after analogue scanners, and come in three varieties: Digital phase 1, digital phase 2, and trunked. This may leave you wondering what the difference is between digital phase 1 and digital phase 2. Digital phase 1 was created to address the matter of congested analogue channels. Whereas analogue channels were 25 kilohertz wide, digital phase 1 channels were 12.5 kilohertz wide. This doubled the number of available channels. More channels were still required, though, so digital phase 2 was rolled out. Digital phase 2 was developed to once again double the number of available channels, offering two within the same 12.5 kilohertz bandwidth. This is accomplished through the use of technology referred to as “Time Division Multiple Access,” or “TDMA.” Technically, there is only one actual channel in use per 12.5 kilohertz, but two conversations may take place on it simultaneously. So it is shared. Why buy a digital phase 2? Phase 2 digital scanners have longer battery life, thanks to TDMA technology. A digital phase 2 police scanner is backwards compatible with digital phase 1, so you can still communicate with those who are using phase 1 systems. With a digital phase 2 scanner, you can hear all agencies, including NOAA, police, rail, aviation, and so on. Why cut yourself out of accessing these channels? Digital phase 2 is considered by most to be more user-friendly than phase 1. Digital phase 2 really is the future for police scanner technology. More and more agencies and individuals are switching to phase 2. Indeed, in many areas, you cannot hear anything without it. If you still are on the fence about phase 1 vs. phase 2, you should check this database to see what format of police scanners are being used in your area. In some locations you can still get away with phase 1, but in many, phase 2 is an absolute requirement. Remember, phase 1 is the past, and phase 2 is the future. So even if phase 1 is still in use in your area, it makes sense to purchase a phase 2 scanner. The phase 1 scanner you buy today may be outmoded in a few years, but the phase 2 scanner you purchase will still be an ideal solution. As with any item of consumer technology, the warranty is another important consideration when shopping for a digital police scanner. The most common warranty is for a year. Some models however may offer an extended warranty which covers more time. Most basic digital police scanners include around 10-20 channels. This is adequate if you will only be listening to a few agencies. If however you will be monitoring many, consider getting a scanner with more channels. If you are purchasing a digital police scanner with an SD card, you can record conversations. In most cases, you probably will not need more than 2 GB. If however you plan to record hundreds of hours worth of audio, you might need more. Some digital police scanners have color screens while others do not. The same is true for touch screens. So you will need to decide whether color is important and whether you prefer a touch screen or buttons to control your device. Both phase 1 and phase 2 scanners may include GPS compatibility (this is more common among phase 2 scanners). With GPS linked up to your digital scanner, the scanner can tell if you have moved to a new area. This allows on-the-fly updating of available frequencies. This is down to ease-of-use. Some digital police scanner software suites are more user-friendly than others. Reading reviews can help you figure out what is best to buy. Also note that your scanner may be programmable via a PC, but there are currently no Mac-compatible models. While many digital police scanners do not include the capability to charge while scanning, some do. Before purchasing a digital police scanner, check and see which frequencies are already loaded in (for example USA and Canadian). The range you see listed for a digital police scanner model is what you can expect at best in clear, unobstructed conditions. Line-of-sight is required for police scanners to send and receive transmissions, so if you are in an area which is forested or mountainous, you will have a hard time getting the full range. The same is true for urban areas. An aftermarket antenna is an option for boosting your effective range. AA batteries are the standard for use in digital police scanners. Battery life can range, but 8 hours is typical. Using high power batteries may help to extend battery life. Check the scan and search speed for the model you are thinking of buying. A scanning speed of roughly 16 per second is fine if you only have around 10 channels to scan through, but you should look for a higher speed if you are listening to a lot of channels. You can also look for a cool feature called “search mode.” This allows you to locate frequencies which are not listed in frequency books and databases (federal agencies sometimes use these). Another search feature to shop for is “service search.” This one makes it easy to search pre-programmed frequencies to find firefighters, police and other services in an area. Police scanner sensitivity is described in microvolts. High sensitivity helps with listening to weak transmissions. Look for a lower number. This indicates a higher sensitivity. You need higher sensitivity if you are operating in a rural environment. If on the other hand you are in an urban location, you should look for a scanner with higher selectivity. This makes it possible to pick a specific station even if there is one right next to it on a neighboring frequency. Otherwise, you might not have enough control. Trunk tracking: A scanner with a trunk tracking feature is necessary if one of the agencies you want to listen in on is using a trunked radio system in your location. Alpha tags: This alphanumeric display system shows you text identifiers for agencies and channels. Automatic mode and step selection: Don’t want to manually select the optimum mode and step for every frequency? This feature will do it for you. Computer control: Put your scanner under computer control. Dynamic memory: A dynamic memory system allows you to customize the sizes of your banks. That way you can shrink some of the bank sizes in order to free up memory. Now you know what features to look for in digital police scanners. Scroll back to the top of this page to quickly compare top models in our chart, or read on for detailed reviews of the digital police scanners which we recommend. Uniden is one of the most popular and respected brands in the world of consumer communication technologies. 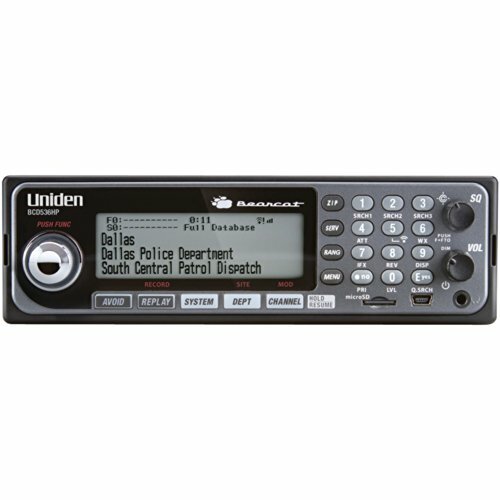 One popular handheld model of digital police scanner which Uniden manufactures is the BCD436HP HomePatrol Series. The police scanner comes with the USA/Canada radio database. Enhanced dynamic memory. With this feature you can save space by controlling your bank sizes. Narrowband reception and location-based scanning are included. S.A.M.E. weather alerts. Stay on top of weather alerts for your region. TrunkTracker V. This feature makes it possible for you to listen in on a variety of different trunked systems. Close Call RF Capture Technology. If there are transmissions nearby, this feature allows the unit to detect and tune to them automatically, regardless of whether or not they are programmed into a channel. 8 hours of battery life. This unit can operate for up to 8 hours on three AA batteries. Compatible with GPS and more. 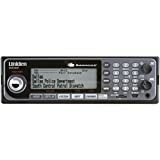 If you have a Uniden-brand GPS system, you can connect it to the police scanner. You also can connect to your PC in order to update your firmware along with the frequency database. Includes plenty of accessories. Your purchase not only includes the handheld scanner, but also a USB cable, a rubber duck antenna, an SMA to BNC adapter, a belt clip, a wrist strap, a user manual, and the initial set of batteries. Great for novice and advanced users. Ease-of-use is great for this police scanner, so if you are a total beginner, it should not be hard to get started. But if you are an advanced user, there are plenty of extra features which you can use to enhance your experience. Battery may be unreliable. With some units, the battery life may not be up to snuff. This appears to only affect a minority of units however; most have no issues with battery life. Some setup is required. Users who want to get going right away without having to do any programming may find it tedious to get started. For others however who appreciate all the customization, this is a plus, not a negative. Whistler is a popular brand in the world of police scanners. One handheld model of digital scanner worth thinking about is the TRX-1. This digital police scanner comes preloaded with USA and Canada data and is designed for ease-of-use and quick setup. Easy setup and updating. You can get started with the TRX-1 just by inputting your zip code. The database and firmware can be updated via the internet. You must however be using Windows. Other operating systems are not compatible. Backlit display. Backlit LCD display and keypad are easy to use, even at night. Masking for encrypted audio. This police scanner detects encrypted audio and masks it automatically. Comes with everything you need. Included with your purchase are the scanner, the antenna, the charging cable, and two battery holders. Dedicated SKYWARN button. Keep up with inclement weather updates on the fly. Clear audio and excellent sensitivity. Even fairly weak signals tend to come through clearly on this police scanner. So for those who live in a rural environment, this may be a particularly good choice. Feature-rich. Once you have this scanner programmed to your liking, you should find that it allows you to listen to pretty much anything you could want and that it is easy to operate. Programming involves a learning curve. Even with the zip code setup process, there is some challenge involved with learning how to program this device in detail, especially if you happen to be a beginner. To some extent however, this is par the course with digital police scanners. 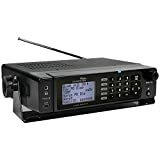 A Uniden base model worth considering is the BCD536HP Digital Phase 2 police scanner. Like the BCD436HP, this is a popular and highly-rated choice online. This model was designed specifically so that it would be easy to program. 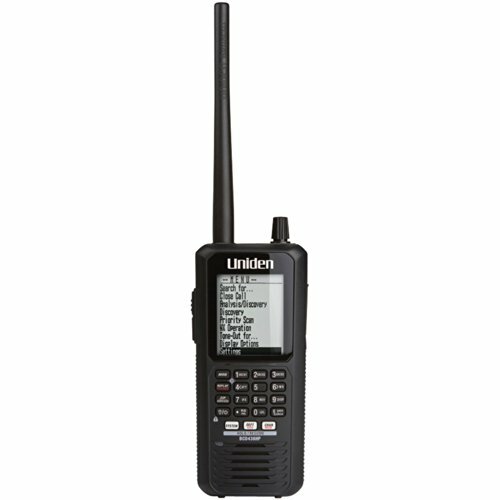 It is also compatible with a smartphone or tablet via the Uniden Siren App. The USA/Canada database comes loaded in. Mobile app. When you connect the Uniden BCD536HP to your smartphone or tablet, you are able to access the police scanner from any location. Close Call RF Capture. Automatically tune to nearby transmissions, even if they are not programmed into a channel. S.A.M.E. weather alerts. Get updates on inclement weather in your region. TrunkTracker V. Listen in on communications on trunked systems. Excellent ease-of-use and fast setup. If you want to start using the scanner right away without doing a lot of programming, you are good to go. You just input your zip code and start using the scanner. This being said, taking some time to program the unit will certainly allow you to get more out of using it. Includes DC cable connection. This is needed because this is a 12-volt scanner, which means that USB power is insufficient. Recording, playback and replay. With this police scanner, you can record audio for later playback. A huge array of features. While this device is designed to be easy for newbies, it also offers plenty for advanced users. There are literally dozens of awesome features. These include CTCSS/DCS rapid decoding, number tagging for channels, a backlit keypad and LCD screen, enhanced dynamic memory, pre-emptive trunking priority, and much, much more. Some units in the past shipped out with a bug involving missing pixels on the display. Whether you end up with one of these or not depends on the seller and their stock. Uniden however is aware of the bug and will exchange faulty units. Like the idea of purchasing a digital police scanner from Whistler, but interested in a desktop digital scanner instead of a handheld model? Think about purchasing the TRX-2. This device comes with a microSD card and is preloaded with the USA/Canada database. Zip code programming. This feature helps you get started quickly and easily if you want to keep programming to a minimum. The radio begins working pretty much right out of the box, though you do need to customize your profile to get it to scan channels which interest you. Update via the internet. If you want to update the database for this police scanner, you may do so by getting online. The firmware can be updated this way as well. Compact design. Even though this is a base unit, it has a low profile and does not take up a lot of space. This is great in a vehicle or on a desktop. Dedicated SKYWARN. The dedicated SKYWARN weather button makes it easy to keep up with inclement weather warnings. The programming software is sophisticated. With some other police scanners, you may feel a need to purchase expensive third-party programming software, but with the TRX-2, that is unnecessary. Great for mobile use. The design of this scanner is ideal if you plan to mount it in a vehicle. You will find that the control head is unlikely to slip thanks to the build of the device. On that note, the build is very sturdy and should hold up great over an extended time period. The display is a bit small. A larger screen might be easier on the eyes. That being said, the screen is still high in quality and displays clearly. It is just a question of personal preference. There is no automatic shut-off. The lack of a sleep timer is an annoyance. Great guide for those who need help on different digital scanners.